Use the Quick Base mobile app to access your apps on-the-go. You open apps from the My Apps page, which displays when you first sign in. 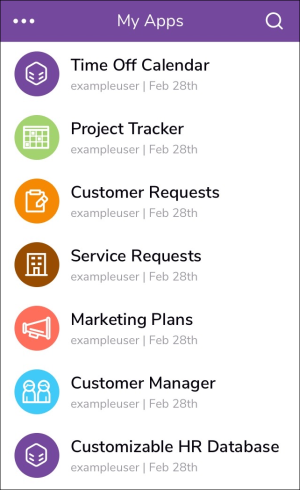 App home pages shown in the mobile app can contain up to three buttons for adding records and opening app pages or reports, and a list of up to three reports. The mobile app home page displays the same report list and buttons that appear in the full site's app home page for that app. Table reports, including those that prompt the user for selection criteria, display within the mobile app. When viewing a record from a report, you can use the navigation toolbar to move from record to record without returning to the report. Also, if you have the correct permissions, you can view the entire record, including fields that were not part of the report. 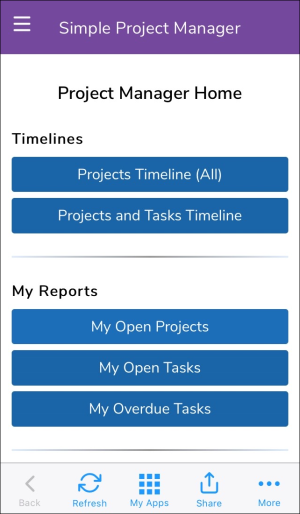 Chart, calendar, and Kanban reports also display within the mobile app. Open an app from the My Apps page. If the report you want is on the app home page, tap the report, and ignore the following steps. Click the Reports & Charts icon next to the table on the menu. Tap the report you want to view. If you select a table, chart, or calendar report, it opens in the mobile app. Find and view the report you want. Tap the Email button at the top of the page. The new email displays in your default email program. Send the email after you finish personalizing it. You can search for records from the menu and from individual reports. If you enter multiple words, Quick Base displays a list of the records that include all of the words you entered. For example, if you search for the phrase, sidewalks of new york, Quick Base displays a list of records that contain all the words: sidewalks, of, new, and york. These words won't necessarily appear together. Quick Base returns any record in which it finds all the words. For example, type Betty OR Bernard to find all records that contain either the name Betty or the name Bernard. To search for multiple words as a phrase, put quotation marks around them. For instance, if you type in "The Big Clock" then Quick Base returns only records containing that entire phrase, as it appears between the quotation marks. Note: Search doesn't search the contents of file attachments. Tap the Search icon and select the table to search from the Table menu. Note: If your app only has one table, the Table menu doesn't appear. 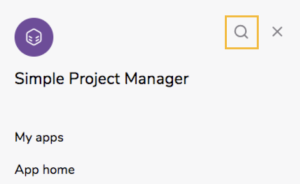 Enter the search criteria in the Search text field. To cancel a search, tap Close . Enter the search criteria in the Search this report field at the top of the report. Note: Although only the first two columns display in the report, Quick Base scans the entire report for your search criteria. To email a link to a record, first open a report containing the record, or search for a specific record. Then, open the record, tap the three-dot icon in the top right, then tap the Email button. The new email displays in your default email program. Send the email when you've finished personalizing it.